I love this weather, when colorful leaves are lying on the ground and sun is shining. This is autumn, which I love, no the autumn, when it's raining. This photos I was taking with Sarah after school yesterday. Last Monday I had also dancing, so I will publish post about them tomorrow. 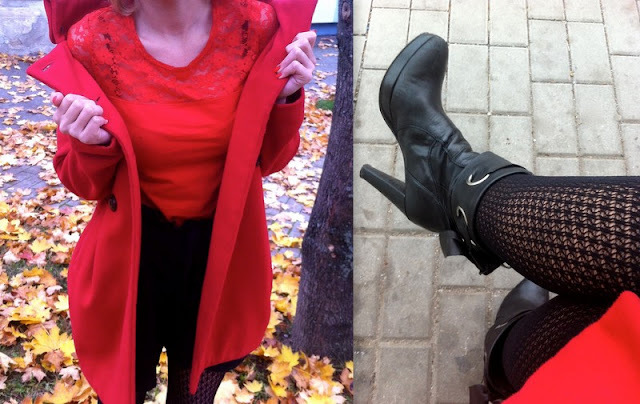 Now about outfit, I chose again this red coat, so some little subtitle for this post can be "red coat: number 4". Otherwise I was wearing lace T-shirt from H&M, which will be in "new in" soon. And I combined it with black shorts from H&M too. A bit more pizzazz gave to this outfit these black perforated stockings. What do you think about this fall outfit? Miluju tohle počasí, kdy všude okolo je barevné listí a do toho svítí sluníčko. Takový podzim mám ráda, ne ten, když prší. Tyto fotky jsem dělala se Sárou včera po škole. Tohle pondělí jsem také měla taneční, tak zítra publikuji článek. A teď k outfitu, opět jsem zvolila červený kabátek takže takový podnadpis pro tento článek by mohl být "red coat: number 4". Jinak mám na sobě krajkové tričko z H&M, které bude brzy v nějakém "new in". A to jsem zkonbinovala s černými šortky také z H&M. A trcohu šmrncu k tomuto outfitu dodávají ještě ty černé děrkované punčochy. Nemyslíte? 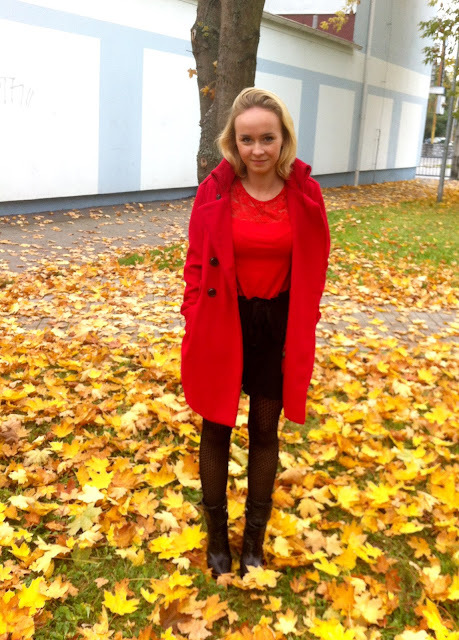 lovely outfit and I love the autumn leaves!!! you look so cute with a red coat !